I’ve always been an easy-going and quick-to-move sort of gal, so when my 7 year old nephew ran into the family room wildly announcing that this was the day to go hiking, complete with waterfalls and mushroom-picking, there was no doubt in my mind of our plan for the day. No need to go far to live out some adventure! As it goes with little people, there was good news and bad news. 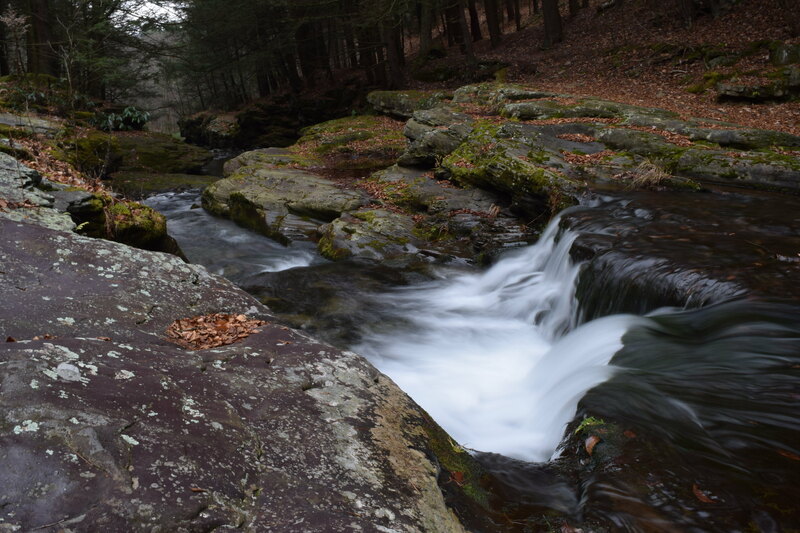 The good news – he knew that the final destination was called Rattlesnake Falls, which Google confirmed to be located in Spring Brook Township, PA. and confirmed to be an actual waterfall by the World Waterfall Database (I swear, I am NOT making this up, it really does exist). He had been taken there by family friends the day before. The bad news – the only thing he really remembered of how to get there was that we had to cross a yellow gate. Thankfully, online navigation as well as Newmans’ easy to follow PA hiking guide: “Great Hikes in the Poconos and Northeast Pennsylvania” saved the day and soon, packed up with 3 kids and a grandfather in two SUVs, we were on the yellow brick road circling the area to the hike entrance in search of a yellow gate. That came quickly enough and we landed at the yellow-gated entrance to the Rattlesnake Falls road entrance. The whole hike could have probably been a quick hour, though we made sure to stretch it into a long and leisurely afternoon. As I mentioned earlier, one of the objectives was the gathering of the local fungi. Thus, upon arrival and meticulous unloading of characters on the rocky mountain road, we began our mycological exploration. My husband, my sister and I looked out closely for familiar mushroom shapes and colors, screaming excitedly as we found one after another — after all, we had just survived several days of what my mother promised to be mushroom rain. I feel that I have to digress here for a moment to explain that while being myco-enthusiasts, we are not experts of local fungi. Simply, we are all Russian immigrants and that is what we do when placed into a forest, especially after some warm rains had passed. Mushroom-picking, salting or pickling is a national pastime, and virtually every Russian can allege to knowing privy family secrets to either picking or cooking mushrooms. I had carried our 1 year old daughter part of the way, as she attempted multiple suicide attempts to tumble down the side of the mountain to the lake. Meanwhile, the rest of my family managed to gather two basket full of mushrooms, with just a few questionable items! The vast majority were American Red Boletus – buttery and sweet mushrooms that are so delightful when sautéed and served as a compliment to chicken, beef or potatoes. Not the guy below – what is that!? As things got curiouser and curiouser… Don’t worry, though we did test some of the mushrooms en route, everyone made it to the waterfalls and back home without injuries. The descend to the big waterfalls was a steep one, while the remainder of the falls scatter across smaller steps – perfect to bathe a 1 year old in crisply-cold mountain river.The remainder of the family likewise enjoyed what was really a Jacuzzi experience. Laying in the river, enjoying the pulsating motion of the downward falling water. Delight for the senses and so close to home! How about trying some other nearby adventures? 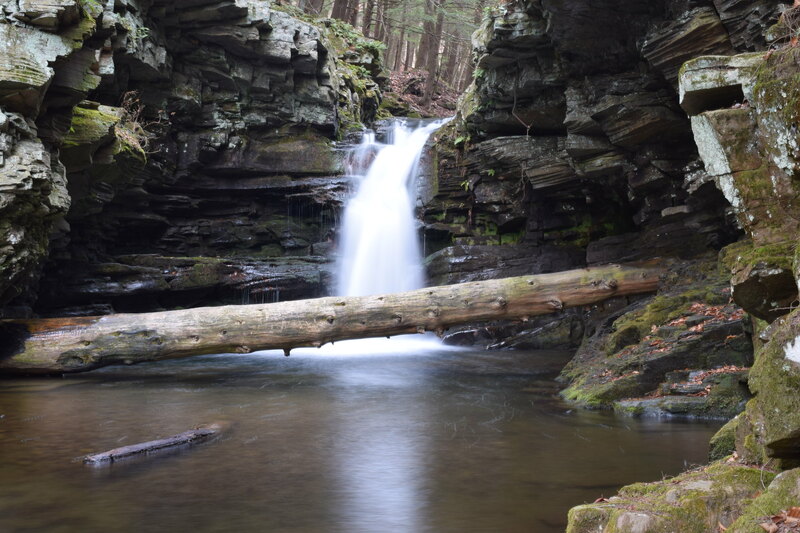 Here is what I found and where will will head next weekend: 20 Gorgeous Waterfalls Hidden in Pennsylvania.